Is it possible to make 8% investing money in stocks every year with zero risk? Well, by now, all investors should know that there are no longer stock ‘markets’. They have been replaced by stock ‘carnivals’. Carnivals are collections of games that are rigged by the owner of the carnival. Think of it this way. We could bet money on basketball games but surely we would not be correct all the time. In a fair game, our team would lose sometimes. But what if we bet our money on a game that was rigged? The winner was selected before the game started. So instead of betting money on an NBA game, what if we bet our money on the Harlem Globetrotters? They have only lost a couple of games in the last 50 years and will lose even fewer in the next 50 years. Why? Of course the game is rigged. The game is for our entertainment and not a true competition of basketball skills. It is an exhibition or sorts. Since the Federal Reserve Bank seized ultimate power in their August of 2007 coup, they have been controlling stock prices for our entertainment and control. And, since we know the game is rigged to be a perpetual bull, all we have to do is wait until the fourth quarter and then place our bets. Of course, we know stocks simply have to move higher every single year from now until the end of time or the dopey citizens might suspect something is wrong. How can this be achieved? We all know that the Fed runs the stock carnival and we all know about the PPT. Their only mandate in reality is to rig stock prices to the moon. Yes, I know. All that other stuff is just noise for the dumb folks. The only question is this. How can we use the Fed’s manipulative practices to our advantage? There are indeed gyrations in stock prices along the way and when prices dip, it is hard to hold long positions in stocks that are now in a bubble and more over-valued than ever before. When stocks start to fall in price, our natural inclination is to sell out. But what if the risk of capital loss was removed? As it works out, we can invest without risk if we examine the chart that I have included below. It is very simple. 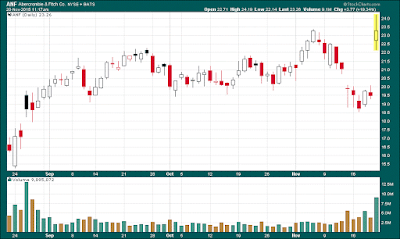 The chart is the Dow Jones Industrial average on a weekly basis for the last eight years. This is the gold line. I have traced the first three quarters of each year in blue and the last quarter of each year in green. Since 2009, the Dow has now had seven consecutive positive years. (Yes, I am writing this with only a few more trading days in the year and the Fed is fighting like mad to make 2015 positive as well by injecting stocks with fresh capital at the Yellen preferred time of 10:30 am. I’m betting they do so. Weeeeeeeeeeee!!!!!) So again, the question is how do we reduce risk to zero and still get carnival gains? Pay attention to the green lines. Since the Fed wants us to feel richer as we keep digging our debt holes deeper and deeper, they goose stock prices every year in the fourth quarter. What if we only invested money starting at the beginning of every October and sold at the end of every December? Have we found the Harlem Globetrotter team of investing/ betting? Okay. In the chart below, we can see that the Dow has climbed from 9000 to 18000. A double in seven years is a ten percent annual return. But, there were some nasty declines along the way that could shake even a CNBC devotee out at some point. Those are along the blue lines. Now take a look at the green lines. 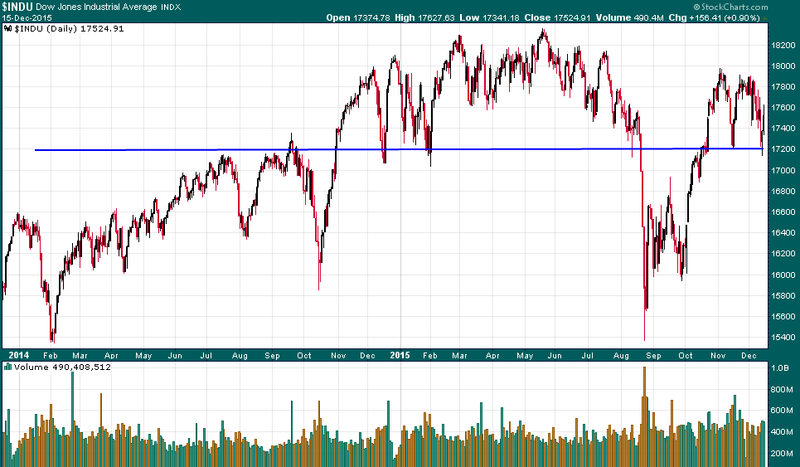 By my rough calculations, the Dow has gained about 9000 points since 2009 with risk mostly in the blue lines. Just following the green lines, the Dow gained some 7000 points of that 9000 with zero risk (except for a ever so slight loss in 2012 because the Fed was about to stop QE). Or, about 8% per year risk free! Thus, we can bet on the Harlem Globetrotters to win every game as long as we only put our money to work in the fourth quarter. In fact, if we go all the way back to year 2000, the same strategy would have worked every year except 2007 and 2008. Now the Fed is completely in charge and it looks like the Dow will climb to the sky! Nothing can stop it. The Fed has a printing press and no laws or morality to constrain it. We just have to remember that risk-free investing is only available in the fourth quarter. See the chart below for the truth. Oh, one more thing. 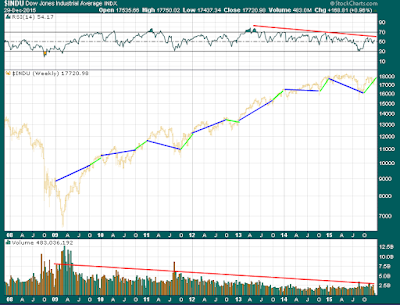 I drew a red line at the top of the chart noting the declining RSI since 2013. Normally, that would be a red flag indicating that the rally over the last few years is a fake. I also drew a red line at the bottom along the falling trading volume. 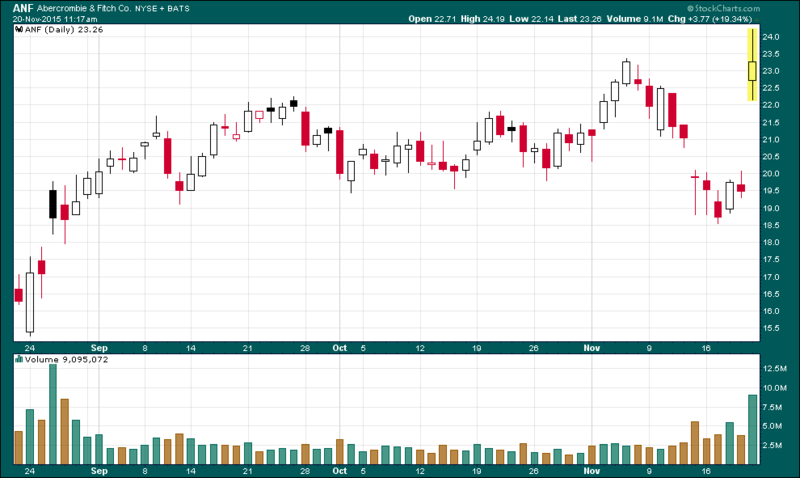 Stock prices have risen as volume has been falling. That would also be a red flag warning that something was wrong. But nevermind. We aren’t in reality anymore. We are at a carnival and we are all winners. Weeeeeeeeee!!!! Thursday, 12/10/15, stock indices rose because (so all the pundits reckon) Fed Chair Yellen made a speech reinforcing her determination to begin raising interest rates on December 16. Friday, 12/11/15, the next day, stock indices plummeted because, well, for the same reason. In bubbles, indices can rise or fall for exactly the same reason. Monday, 12/14/15, stock indices see-sawed back and forth between positive and negative like a ping-pong ball in a lottery machine. Up a hundred. Down a hundred. Up a hundred. Back to zero. Then, in the last 45 minutes, the Dow burst higher some 130 points because, well, the PPT wanted the index higher. What brings me to this conclusion? On a day which the Dow rose some 130 points, declining stocks led gaining stocks by a ratio of 4 to 1 on the NYSE. Yet, the reverse was true of the Dow. Gainers led decliners 23 to 7. The Fed has obviously become better at ‘precision’ buying geared toward manipulating our psychology. Bubbles are driven by insanity. Tuesday, 12/15/15, stock indices immediately burst higher with the Dow up some 200-plus points late in the day. Why? Because higher rates are surely on the way! Ain’t it great! Bubbles ignore reality. Only in a bubble does this happen. Stocks continue to rise. Okay. That’s fine. However, median PE ratios are now higher than they were in either 2000 or 2007. Stock indices are driven by companies that sport PE ratios that now require exponents. AMZN now has a PE of some 10 cubed. Netflix has a PE of 10 squared. Consumer spending is supposedly up in November and yet retailers reported ‘Black Friday’ sales as being down some 10% from last year. Consumer confidence supposedly rose last month yet the Fed said americans lost some $1.2 trillion dollars in net worth in the third quarter. Bubbles embrace the lie. Food for thought. Ford’s sales are up and McDonald’s sales are not. For the year, Ford is down and McDonalds is up. Why? McDonalds is a member of the Dow and Ford is not. Stock prices are for our manipulation. They have nothing to do with financial fundamentals. Bubbles are artificial. So what should we expect when the Fed raises interest rates on 12/16/15 for the first time in 8 years? Really? Doesn’t everyone know that the Fed stands ready with trillions of dollars to manipulate the Dow higher for our prolonged hypnosis? 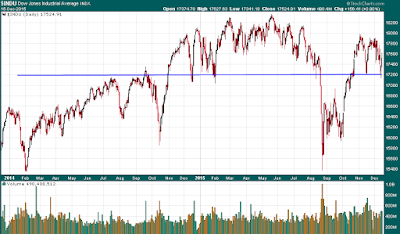 The chart below shows us a good example of resistance turning into support. 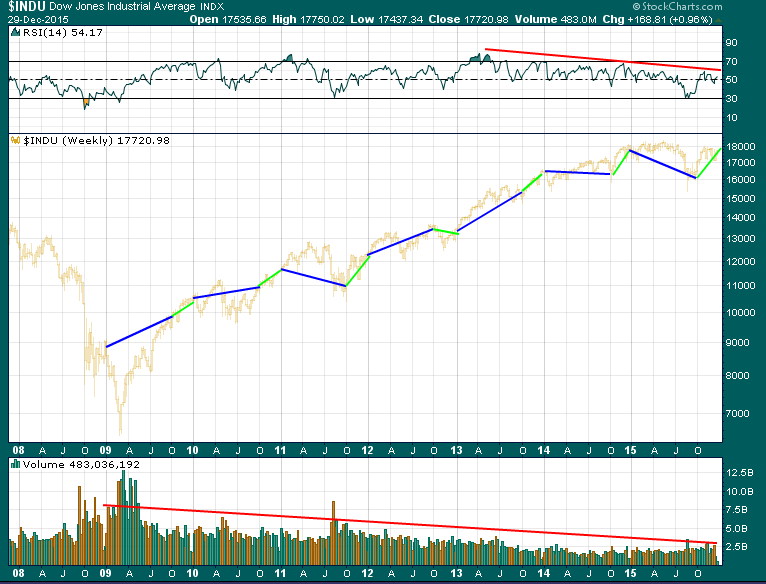 Dow 17200 (the blue line) looks to be the Fed’s ‘line in the sand’. Use this line as the new bottom courtesy the Federal Reserve. Enjoy the bubble! Investment bubbles are not hard to spot. There are times when insanity trumps everything and prices move higher and higher in spite of reality’s tethers. Bubbles float on insanity. Wild speculation. Irrational expectations. Hope. This week that ended 11/20/15 is a good example of another such bubble. Mass murderers struck Paris and Mali. More retailers reported slower to no growth. The Fed issued more warnings of a December rate increase. Japan lapsed into another recession. Europe is so slow ECB chief Draghi continued his rhetoric of doing anything and everything to save European stocks. Uh, I mean the European economy. And yet, the Dow gained over 3.5% on the weak. What gives? The explanation from the carnival pundits was that the US was a ‘safe haven’ for investors who were fearful and had no where else to put their money. Really? Well I’m going to have to call ‘bulls#%t on that one. 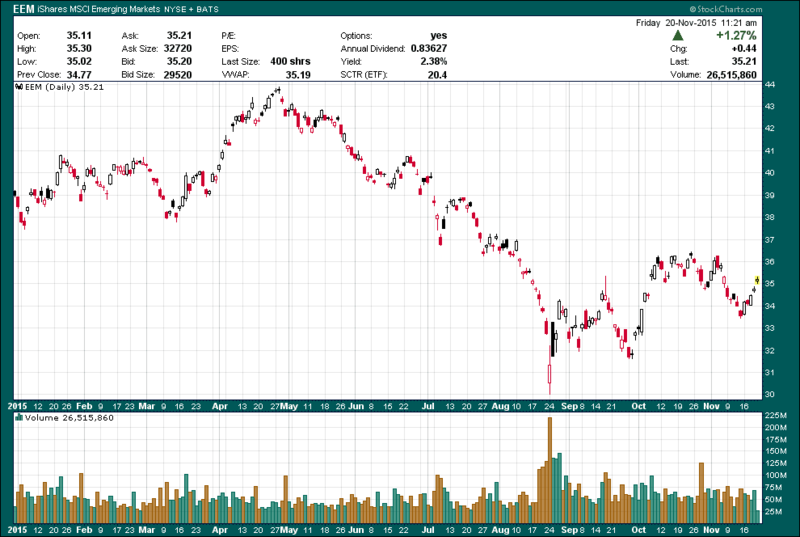 The chart below is the emerging markets ETF, the EEM. Emerging markets were actually up on this Friday (11/20/15) almost twice as much as the Dow. The pundits are all idiots. Case closed. See the chart. What could be another rally excuse? Oh yeah, corporate earnings are beating ‘analysts’ expectations. Well, ‘analysts’ are more akin to fortune tellers in their prognosticating prowess but that’s another story. The analysts are simply Wall Street shills whose function is to generate ‘buying’ opportunities. They do so by lowering expectations so that bloated companies can simple roll over the bar rather than jumping it. A case in point is the clothing retailer Abercrombie and Fitch. The company reported their most recent quarter as such. Check out this quote from the Business News: “Abercrombie's sales have fallen for 11 quarters in a row, but the decline has slowed in the past two quarters, signs that business is improving after the company revamped merchandise, improved customers' in-store experience and shuffled management.” That’s right. The writer wants us to believe that business is improving after 11 straight quarterly declines in sales. Business is improving because, according to the writer, sales are not declining as fast as they were. Further, a company executive said that the company remains ‘cautious’ going forward and they expect the holiday sales quarter to be flat compared to last year. To be fair, Abercrombie did say that income more than doubled due to cost cutting. Cost cutting can only juice earnings for so long. And, as comparison on this day, fellow retailer The Gap reported a 2% decline in sales and yet the stock price was up over 7.5%. However, Abercrombie was the clear winner. What does 11 straight quarters of declining sales and a tepid holiday quarter prediction get you in a bubble? Of course! The stock price is up over 25% today as I write. See the chart below. Bubbles are like this. Isaac Newton described the bubble of his era as ‘the madness of men’. True, but what is behind such insanity? The Federal Reserve Bank comes to mind. The members have all echoed the same warning. They are going to raise interest rates at their next meeting in December, 2015. Since their only function is to support Wall Street while they steal all the assets from the feckless US government and her profoundly and profanely ignorant citizens, it seems to me that FRB is goosing the stock indices higher to give themselves a little downside cushion should a selloff great their action. How else could one explain the best weekly stock gain all year for the major indices? The US federal minimum wage is getting a lot of attention these days. I have no doubt that the current $7.25 per hour minimum wage will be raised soon because american intellect has been diseased and destroyed by a Pelosi-like infestation of terminal ignorance. Americans are no longer capable of examining a problem fully to understand the correct solution. Sound bits, regardless of their relation to truth, have replaced logic. Consider this. At the current minimum wage of $7.25 per hour, a 40-hour work week over 52 weeks of the year would gross about $15,000 federal reserve notes in wages. 2015 tax tables, with no deductions, would net the worker about 14,500 after about $500 in federal taxes are deducted. For a standard of comparison, that worker could purchase about 5,800 gallons of gasoline during the year at around the current price of $2.50 per gallon. If minimum wages were raised as suggested by unions and other groups driven by profound ignorance to the proposed $15 per hour, that same worker would gross about $31,200 federal reserve notes per year. Using the same tax table, the worker would now pay about $2,700 in federal taxes per year for a net of about $28,500. How much gas will the $15 federal reserve notes per hour worker now be able to buy? As anyone with a a single functioning brain cell knows, wages push inflation. Even an idiot like former fed-head Greenspan knows that. Double wages doubles inflation, more or less. So, now a gallon of gasoline goes from $2.50 per gallon to $5.00 per gallon. With the new raise, the worker can now by about 5,700 gallons of gasoline. In this example, a doubling of the minimum wage would result in the worker being able to buy less gasoline than they could before the wage increase. Yes, this is theoretical as we all know tax rates can be changed and other factors can influence the actual price of gasoline. Increasing wages is not a zero sum game. Higher wages do not necessarily equate to a higher standard of living. As long as the FRB works to stoke inflation, living standards will continue to fall for the less-wealthy. And, it’s not the fault of McDonald’s. It’s the fault of the FRB. Word to the workers. Stop protesting in front of restaurants. They are not responsible for the loss of purchasing power of the currency. The FRB is. Protest in front of their building! The truth is the current regime favors minimum wage increases because wage increases result in more tax revenue for a hopelessly in debt gooberment. And, those tax revenue increases are imposed upon businesses that are forced to pay more in wages. Essentially, minimum wage increases are actually sneaky ways to increase tax revenue. The american public remains none the wiser. For Stocks, Things Are Always Getting Better! On Monday evening, May 18, 2015, ECB board member Benoit Coeure gathered together a group of bankers and hedge fund managers. That evening, Mr. Coeure gave them the ECB’s game plan for accelerating bond purchases in the euro-zone. Of course, this was a closed meeting and the general public, the slaves, were not privy to this information that would surely move equity and monetary indexes. This group was given ample time on Tuesday morning to set their positions accordingly. Then, around noon, the public was informed of the new ECB intention. This is known as ‘insider trading’ and it is a felony unless of course the person or institution using the insider information is a banker or bank or hedge fund manager. So, we can all conclude that equity prices are gamed by the same people who rig them. Average investors simply need to understand the criminality. At the end of May, 2015, the US economic propaganda machine admitted that first quarter GDP was far worse than previously anticipated. GDP actually shrank by seven-tenths of a percent. Given that central bankers had pushed stock indexes to all-time highs, logic would follow that the same stock indexes would quickly be torn apart. But alas, we are not in a logical world. Nor, are we any longer in Kansas. Nobody knows where we are frankly. We now live in some undefined murky world of smoke and mirrors. We seem to be standing but we don’t know what supports us. Instead, stock prices hardly wiggled. Why? The pundits and the propagandists went to work on the networks they completely control. Here is the explanation. First quarter is history. It is meaningless. First quarter is in the past. Things are already getting better so stocks should be bought as we should ignore first quarter data. Hmmm. I wonder if the reaction would have been the same had first quarter GDP been reported to be up 5%? Yes, I think we all know that the Dow would have rallied 500 points on that news. And consider this. Aren’t we told that things are always getting better? Has anybody from the US propaganda machine ever given a warning that the economy was getting worse? No. It does not work that way when bubbles are being blown of historical proportions. We live in a world of mind control that is hinged on the constant lie. Consider this. The FRB keeps interest rates at zero so their bankster conspirators can continue to game the system through thievery. 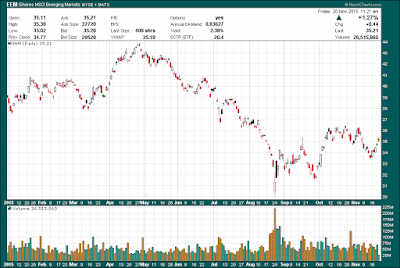 If zero rates spiked inflation, they would have to raise interest rates regardless. However, the gooberment mafia simply lies about all things inflationary. Car sales make up a huge piece of the consumer spending pie. Yet, car manufacturers report an ever increasing rise in the price of new vehicles. Yet, there is no inflation? The average car payment in the US is now $488 dollars per month for average terms longer than five years. Housing costs continue to rise. Insurance costs are rising. (Why do insurance premiums continue to rise? Because the cost of medical care continues to rise.) Taxes are rising. In fact, the only thing not rising is human intellect. To even postulate that inflation is low is an exercise of stupidity that borders on Bernie Sanders kind of stupid. Yes, Mr. Sanders is running for the office of White House Occupant (WHO) with the idea of raising tax rates to 90%. Apparently Mr. Sanders has been captured by aliens who took an egg beater and scrambled what little grey matter he had and then sucked it out like a milk shake. The fact is a 90% tax rate guarantees that tax receipts will equal exactly zero. No one will work if they lose 90% in taxation. However, I have no doubt that in america these days, Mr. Sanders will have many supporters. Of course, that does not matter. That stuff is history and things are getting better. Car prices are set to begin falling soon. Everyone that wants one will soon have a job that pays more than $15 dollars per hour. And no, doubling the minimum wage will not make prices for the goods produced by said workers go up a bit in price. Clearly, the FRB is not going to allow for the stock indices to plunge. That’s why they are so active with the PPT at the 11 AM rally hour. Clearly as well, the FRB is dead set to keep the Dow above the 18000 mark for the time being until they can push it to 20k and beyond. See, things are always getting better! The bottom line is easy. Buy stocks. Forget the past. Ignore the data. For God’s sake ignore the truth! We have a bubble to carry us higher and higher! Weeeeeeee!